There is very loud, very bad Karaoke singing, lots of insects and a crocodile called Bob just outside the door. Welcome to Belize. We are camped by the side of New river in the town of Orange Walk at Jungle River Tours (a combined restaurant, river tour company and RV park run by the Novelo Brothers at N 18.077025 W 88.556908. Strongly recommended (except for the Karaoke). Probably the the most famous structure at Lamanai is the Mask Temple dating (as I expect you know) from the Middle Early Classic to the Late Classic period. 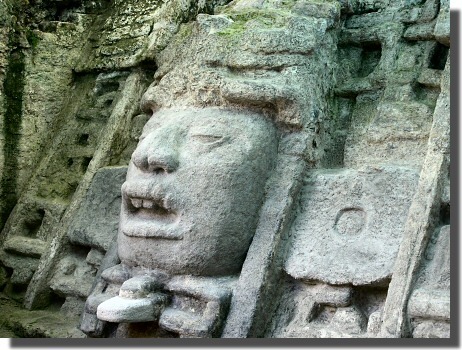 It is (and I quote) "infamous for its carved limestone masks which depict Olmec characteristics". We spent our last two nights in Mexico on the coast near Peurto Bravo at a half open Hotel/RV park (N 18.776677 W 87.671620). The very friendly owner was getting the hotel ready for the season, but was happy for us to camp anywhere on the beach. We spent a relaxing time watching the pelicans fishing, re-organising our stores and eating up our fresh food before tackling the Mexico/Belize border. The border crossing was straightforward and well organised. On the Mexican side we had our passports stamped and surrendered our temporary import sticker for the vehicle. We were then issued with a certificate to say we had re-exported the vehicle. The vehicles were not inspected, nor were the VIN numbers checked. The Belize side was slightly more complex but very friendly. 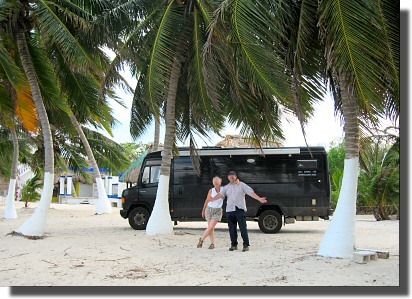 We purchased one month of third-party insurance for $30USA (payable in US, Mexican or Belize currency). We had our wheels ineffectually sprayed with what looked like dirty water for $6.50USA. We had our passports inspected and stamped by an immigration office so laid back he was horizontal (welcome to paradise ...let me tell you a joke about...). Customs issued a temporary import document for the vehicles and stamped the drivers' passport to say (in effect) that they can not leave Belize without the vehicle. The VIN number of the vehicles was checked against the registration document. There were then several food inspections, the end result of which was that K-Nine lost their tomatoes and open packets of cheese (as part of Belize's policy to prevent the spread of bird-flu!) but Mog and Bodo got thru unscathed, in spite of admitting to having fresh fruit and vegetables. Belize (a former British colony) uses English rather than Spanish, has distances in miles, not kilometers, drives on the right, but has dollar bills with the British Queen's head on them them (though I think I detect a hint of Princess Diana in the portrait). Intrigued by our guide's description of the Mennonite community near Orange Walk we decided to try and visit the Mennonite "camp" at Little Belice. 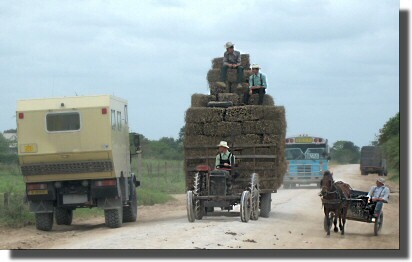 The Mennonites reject many aspects of modern society (in some ways they appear similar to the Amish). Most personal transport is by horse drawn buggy (many with independent, torsion bar suspension). Nearly all the men wear dungarees and white hats. The women wear long, old fashioned, dresses. Some Mennonites reject mechanized agriculture but most seem to use tractors, but only with metal not rubber wheels. We never really found a town of Little Belice but we did find a shop so we stopped. (We bought hot dogs but rejected the pigs tails.) We learned that about 1000 Mennonites came to Belize in 1958. There are now about 7000 (less 2% of the population). They do indeed produce all the poultry, most of the meat and much of the rest of the food eaten in Belize. They do not vote and live in what they describe as "camps" separate from the rest of the population. We were shown round the local poultry packing plant. Our reception was polite but not exactly friendly. Because the Mennonites, particularly the children, are all similarly in appearance, similarly dressed and appear very serious they produce an eery, slightly disturbing atmosphere.